After watching ‘San Andreas‘, one thing became apparent – I don’t think there’s anyone else I’d trust more to save me in a crisis than The Rock! ‘San Andreas’ is an enjoyable disaster movie, marrying up stunning special effects with a solid script and likeable characters. Throughout the film there are of course numerous plot contrivances, and there’s a strong sense that we’ve seen all this before, but the plot moves so quickly from development to development that we’re barely given time to stop and think about them. The film takes place primarily in San Francisco and the Bay Area in general, with the premise surrounding the San Andreas fault line causing significant tremors. 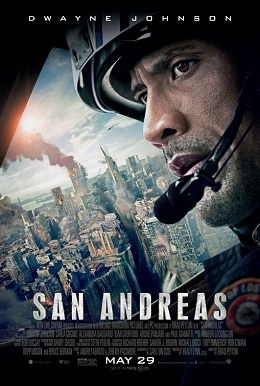 The film essentially boils down to a couple of key characters, with Dwayne ‘The Rock’ Johnson’s helicopter pilot, Ray, trying to rescue his family, whilst Paul Giamatti’s seismologist attempts to predict the next event and notify the general public. We spend most of the time with Ray as he first tracks down his estranged wife Emma (Carla Gugino), then sets off to locate his daughter, Blake (Alexandra Daddario) amidst the destruction in San Francisco. The film begins by providing a little bit of setup to outline the family dynamics, but primarily that is just to provide a bit of extra power to Ray’s story and keeping it to a minimum works well for the film’s overall structure. Usually in a disaster movie you’re quite glad when people start dying due to the general knack for creating irritating characters, played by even more irritating performers, but ‘San Andreas’ mostly avoids this with strong performances from its core cast. Johnson has become one of the most reliable performers in action cinema lately and he’s in good form again here, with solid support from the likes of Gugino and Daddario. The sequences with the seismologists are a little less developed, but the material is delivered by seasoned performers in Paul Giamatti and Archie Panjabi which helps measurably. I had a blast watching ‘San Andreas’, finding myself gripped by the plot developments and wowed by the outstanding special effects. Thoroughly enjoyable fun.